The first thing any of us want to do when we encounter unpleasant household odors that won’t go away with regular cleaning is to discover how to get rid of bad smells in the house. If your bathroom, kitchen, or laundry room continue to stink no matter how much you clean them, and you’re asking yourself why does my house smell like sewage, you may be suffering from sewer odors! Sewer odors can occur anyplace in your home with a drain or water line; sinks, showers, bathtubs, and yes, toilets, can all lead to a musty smell in the house or a sewer smell in the house. You’ll need to learn how to get rid of bad odors in the house if you ever hope to breathe with ease when you walk into the stinky room. Instead of turning to chemical-laden air fresheners to mask the odors, look for ways to identify and repair the causes of sewer odors. Read on to discover how to get rid of bad smells in the house and leave your whole home smelling clean once again. Why Does My House Smell Like Sewage? Strong sewage smells in the house may originate from several locations and then spread throughout your home, leaving it smelling like a septic system. There are several common causes of these smells. Here are four areas in your home that sewer smells may be coming from and the reasons for the smells. Water trap: If your washing machine, laundry tub, water heater, or other appliance has a water trap, take care to maintain the trap water levels. When you don’t use basins and sinks for extended periods of time, the water can evaporate; this, in turn, can let sewer gasses up and into the room. 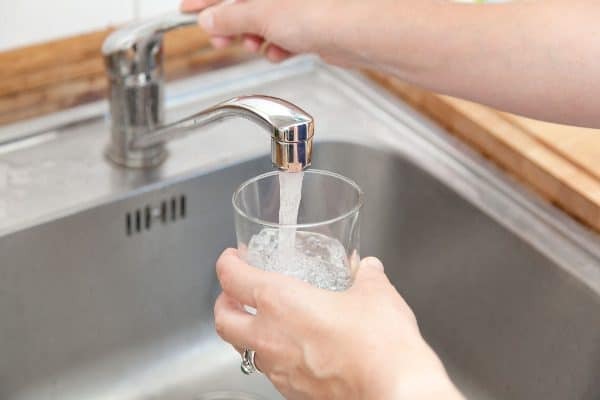 Solve water trap odors with ease by pouring a glass of water down the trap, which will restore water trap levels and push the sewer gasses back down. Missing cleanout plug: Another potential problem in the floor drain, a missing cleanout plug leaves space for sewer gasses to come straight from the drain bowl into your home. If the cleanout plug is missing, you can easily find a replacement at most home improvement stores. Broken sewer line: The greatest (and most difficult to fix) cause of sewer smells in basements can be from broken or cracked sewer lines. Damage to sewer lines can occur where the pipes are not visible, such as in walls or under flooring. Because of this, hiring a plumber who specializes in finding leaks may be necessary. While it may seem surprising, sewer smells from shower drains are more common than those from toilets! There are two main culprits for sewer odors in shower drains, and only one is plumbing related. Infrequently used shower drains most commonly cause sewer odors. Without frequent use, the water in the p-trap can evaporate; without water in the trap, there is nothing to keep sewer gasses from getting in. Therefore make sure you keep your shower clean disinfected to prevent any smell or odors. This kind of odor typically improves after running the water for several minutes. If your plumbing is not the problem, a dirty drain may be. Over time, biofilm builds up in our drains and pipes; this buildup can cause a sewer like odor, which worsens when you run water. 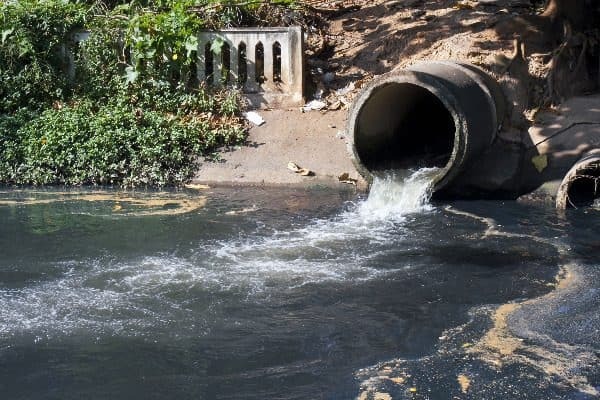 Instead of pushing the sewer gasses back down, the water flow disrupts the surface of the biofilm and causes even stronger smells to be released. Luckily, to eliminate biofilm, you just need to clean out your pipes. Using soap, hot water, and a brush, clean drains to the p-trap before rinsing with cold water, which should eliminate future odors. Find more powerful vinegar and baking soda based drain cleaner recipes and “how to unclog a drain” tips here. Sidenote: The base ingredients for this natural drain cleaner are similar to homemade carpet cleaner recipes. Make sure you keep white vinegar and baking soda in mind when thinking about powerful home remedies for cleaning. 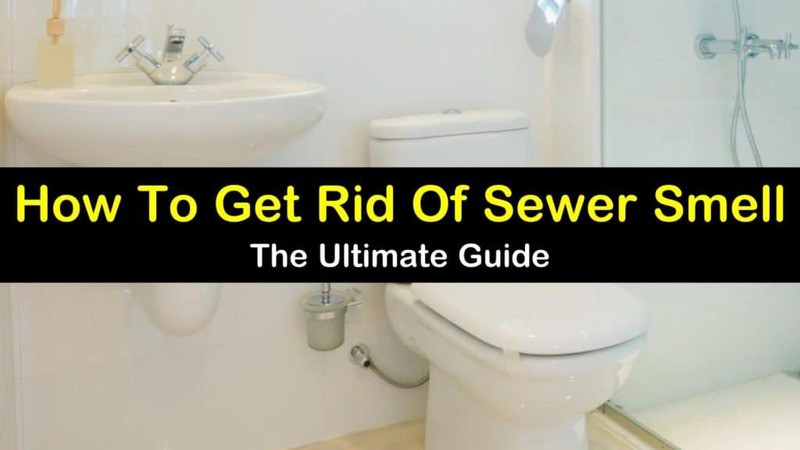 Sewer smells from toilets are often the worst in the house because they connect directly to a septic system. 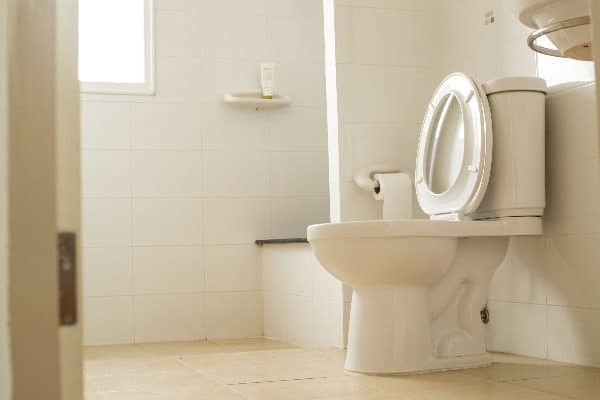 There are two main reasons why your toilet may be producing sewer odors. The wax ring seal between the base of the toilet and the flange can become damaged over time. Furthermore, toilets that were installed imbalanced and rock are the most common cause. A broken wax ring seal can let sewer gas up from the bottom of the toilet. Removing the toilet and replacing the wax ring should eliminate the odor; likewise, using shims can help level the toilet to prevent rocking from breaking the ring again. Then, use caulk to protect the joint. Make sure you clean and disinfect the area with a strong homemade toilet cleaner. While less likely, water in the toilet trap may also have evaporated, allowing sewer gas to seep up and into the room. Infrequently used toilets, such as those in guest bedrooms or basements, are usually the culprit, but a long absence from the house, such as an extended vacation, may also be the problem. If you get home from a trip to discover a sewer odor in your bathroom, check levels in the water trap before calling a plumber. Kitchen sinks and bathroom sinks alike can cause stinky sewer odors. Similar to both showers and toilets, a lack of water in the trap can cause sewer odors to come up through the sink drains. Infrequently used sinks, such as those in basements, outbuildings, or wash basins, are most likely to develop these odors. If biofilm build up is the culprit of your sink sewer smell, removing and thoroughly cleaning the pieces may help eliminate unpleasant odors. You can remove the pivot rod, pop up stopper, p-trap, and gooseneck from the sink and soak them in a mixture of warm water and bleach. After reassembling the parts, pour boiling water down the sink to completely remove any remaining biofilm residue. If sewer odors have taken over your home, think twice before calling local plumbers. Here’s how to get rid of bad smells in the house all by yourself. These DIY solutions can help eliminate sewer odors, without the expensive plumbing bill. Vent openings are often above the main bathroom in the home. Clogged or blocked vents from leaves, debris, or dead animals can prevent sewer gasses from properly venting. To keep sewer odors from coming back, consider adding preventative drain maintenance to your house cleaning checklist. Regularly cleaning out your drains can prevent biofilm from building up in the pipes. To avoid the use of harsh chemicals, or disassembling pipes, use household items. Pour vinegar, followed baking soda down a drain, allowing it to sit for two hours. When finished, flush the drain with hot water to wash away the loosened biofilm. We hope you’ve now learned how to get rid of bad smells in the house. 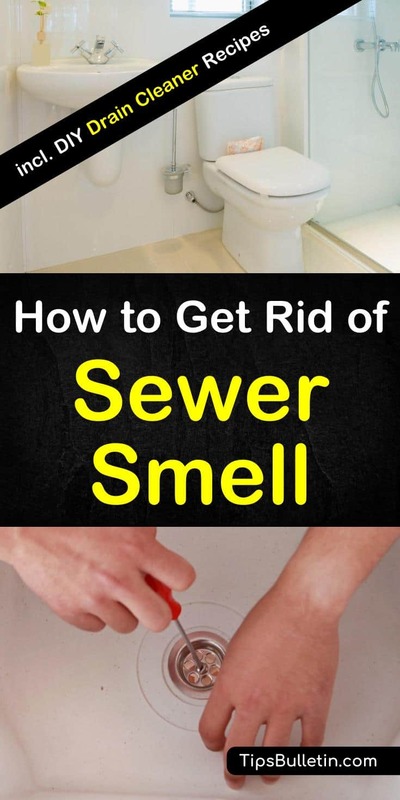 Identify and fix the source of the smell to get rid of pesky sewer gas smells for good! In this article, you learned the answer to the question why does my house smell like sewage. You learned what can lead to a musty smell in the house and what can lead to a sewer smell in the house. Did I leave anything out? Let me know in the comments and use the buttons below to share on Facebook, Twitter, and Pinterest!